The Victoria Falls Hotel in Zimbabwe was built in 1904 and is the oldest hotel in Victoria Falls. It is an old colonial hotel, and has a long and colourful history of the many people that have passed through its doors. 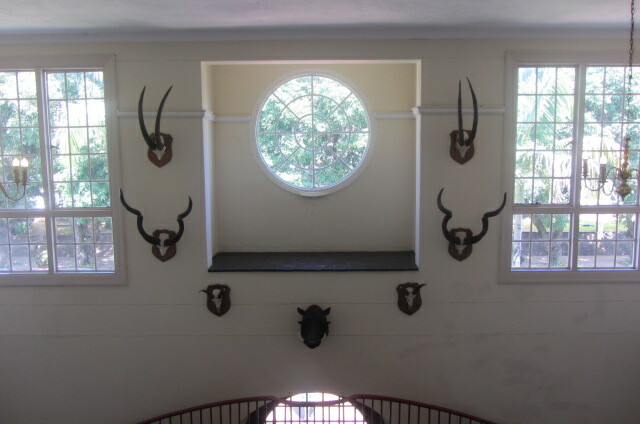 Going up the winding staircase, you come across these hunting trophies, showing the twisted horns of the different types of wild animals brought back by hunting parties, in a time when hunting, fishing and shooting were normal pastimes for the rich and famous visitors to the wilds of Africa! This week Ailsa from ‘Where’s my Backpack’ asks us to show some misty photographs, and my favourite place in Africa is Victoria Falls, where there is always mist as the Zambezi River rushes over the Falls into the deep gorges below. The mist from the Falls can be seen from miles around, especially when it’s rainy season upstream, and there is a huge volume of water hurtling downstream. This week, Cee’s challenge is to show pathways, bridges, roads, walkways, railway tracks, and of course, signs. Let’s see what we can come up with! 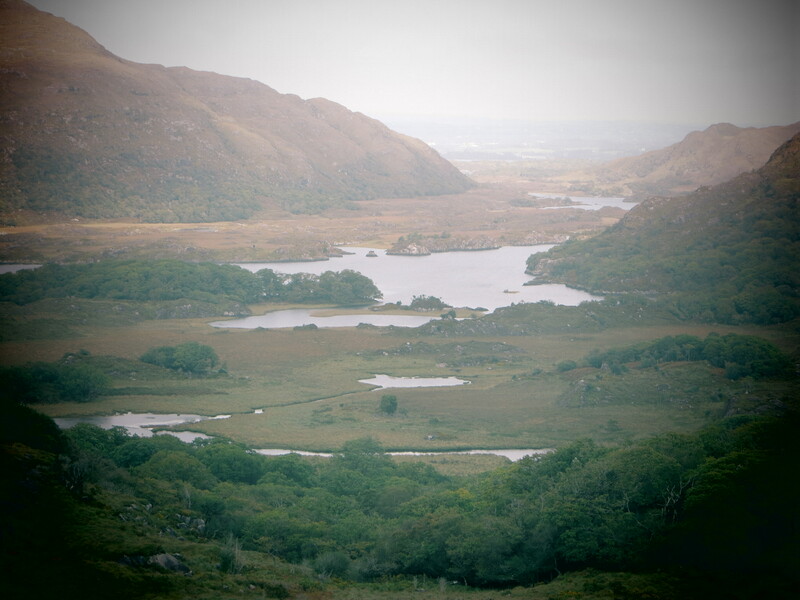 These old railway sleepers are now put to good use to help climbers get to the top of Torc Mountain, near Killarney. As you can see, the solid wooden sleepers are covered with wire so that they are not slippery in wet or icy conditions. When you start to climb a hill, it can sometimes be daunting to look up at where you have to go! A fairly long way to go! Steps to a secret hideaway. And here is the railway bridge between Zimbabwe and Zambia, at Victoria Falls– this bridge will be familiar to anyone who has bungee-jumped while on holiday at Victoria Falls. For the brave readers among us, it’s a 111 metre drop into the Zambezi river below. And specially for Cee, here is a sign you might like! My Earth photo was taken in Norway at the beginning of winter 2009, when I visited for my grand-daughter’s first birthday. There was a little snow, but by Norwegian standards, it was hardly worth mentioning! The second Element is Air, and I have 2 photographs for this. They were taken on a windy day in Howth harbour, looking out at Ireland’s Eye, it was cold and looks like the heavens are about to open in the second photo, even though in the first one (taken a few minutes earlier) the day looks almost pleasant! The storm is brewing – time to go inside for a cuppa! 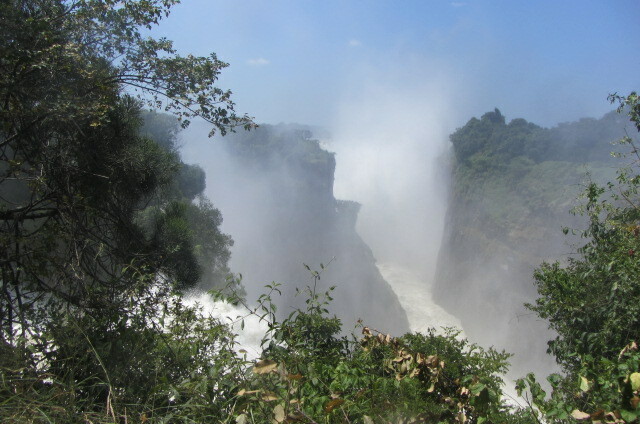 For my Water element, I am moving to another country again, and showing you 2 photos of the Zambezi river thundering over the gorge at Victoria Falls, this is one of my favourite places to visit. And for my final element-Fire – my first photo is that Fiery Ball in the sky, which warms us all from millions of light years away, and gives us energy, makes us happy, and makes us sad when we can’t see it. and finally, my own cosy winter fire that keeps me warm when the sun has gone away on a winter break. For this week’s Weekly Photo Challenge:Change I would like to show you some photos of an African sunset, and anyone who has lived or visited Africa, knows that the sunsets there are spectacular. These photos were taken on the Zambezi River just before the sun sank (which it does very quickly) and the sunny, hot day changed to a tropical dusk,and then a starry night.